110 New Saar - 1947 / 59, very nice mint never hinged collection, complete with all issued stamps in the KABE hingeless illustrated album. Also the scarce initial printing set in perfect condition mint never hinged with photo certificate \"perfectly mint never hinged condition\" Ney BPP, 2 Fr. Initial printing unperforated, the flood souvenir sheet, Council of Europe, all welfare sets, official stamps set and so on. A very nice quality object! 143 /⊙/ 226/38I Saar - 1920 / 59, rich collection, almost completely formed in the Schaubek album with a lot of better issues, slightly mixed condition, with much perfect material. 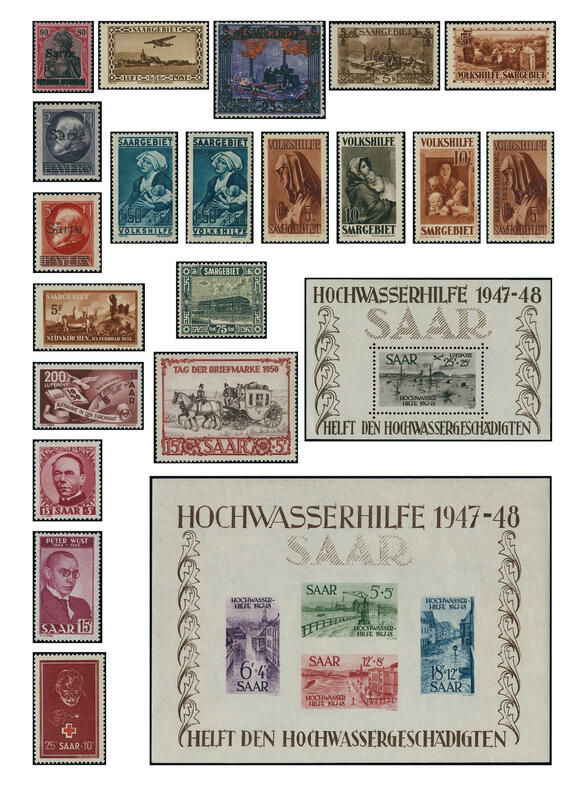 With also Sarre-Germania, all three landscape sets from 1921 / 22, peoples help 1926 / 27, castle people help series, referendum peoples help set, referendum postage stamps set complete on covers, as well New Saar including initial printing set (Michel no. 226 / 38 I), all peoples help sets, Council of Europe, flood souvenir sheet pair, official stamps set and so on. Favorable valued collection with very high catalogue value! 150 ⊙ New Saar - 1947 / 59, neat cancelled collection, in the number of a major listing complete on lighthouse hingeless preprinted pages, stamp without guarantee, with also the flood souvenir sheet pair, all welfare sets, Council of Europe, Day of the Postage Stamp, official stamps set and so on. Michel for genuine used approximate 9200,- €. 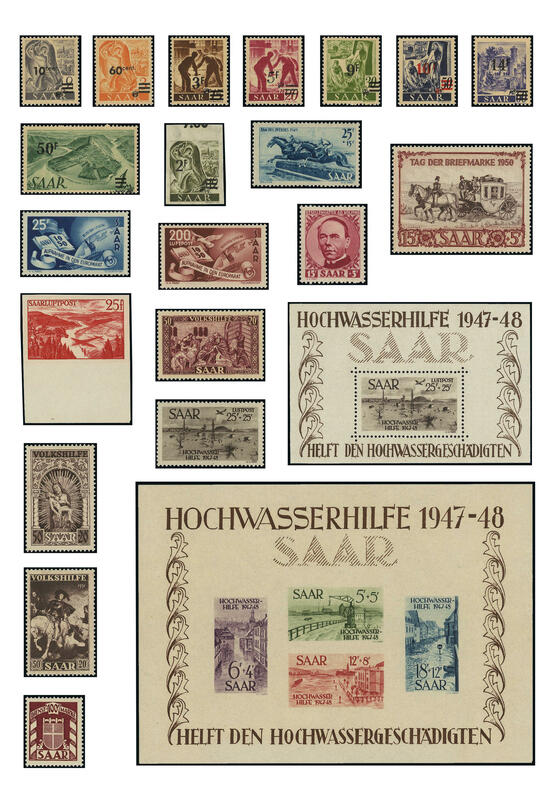 210 ⊙ Saar - 1920 / 34, interesting used collection the old Saar issues in the Lindner T hingeless printed form ring binder, as well numerous better issues, stamp without guarantee, including all three landscape sets, peoples help 1927, peoples help 1928, sheet people help series, referendum postage stamps set and so on. Favorable valued! 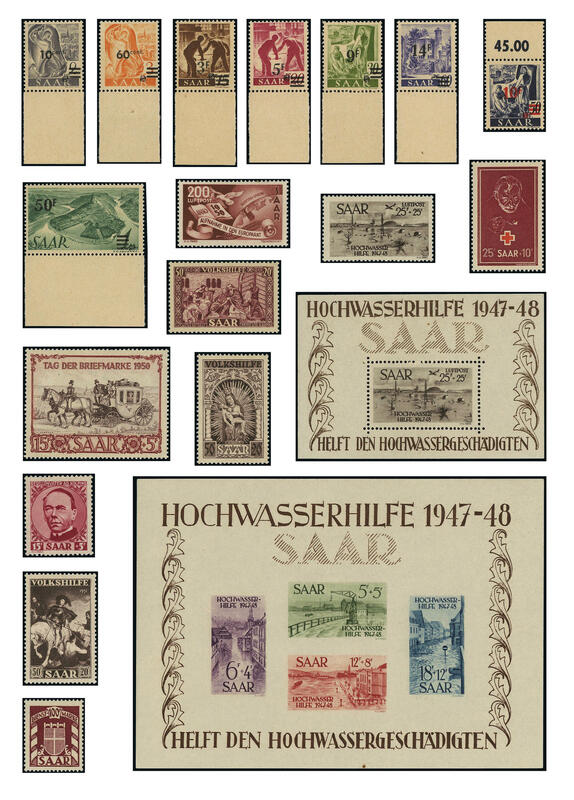 245 Kart⊙n Saar - interesting lot old Saar issues packed in a carton, on stock cards, in covers and so on, with also numerous overprint items Sarre-Germania, welfare sets and so on. Treasure trove! 258 ⊙ Saar - 1920 / 59, extensive used collection in the Lindner hingeless printed form ring binder almost completely formed with a lot of better issues, stamp without guarantee. Thereby also strong part old Saar including all landscape sets, peoples help 1926, 1927, 1928, 1929, castle peoples help, referendum people help series, as well also the accordingly postage stamps issue. Besides is New Saar in the number of a major listing complete available including flood souvenir sheet pair, all welfare sets and so on. Reasonable conservative estimated! Michel for genuine used approximate 20300,- €. 306 New Saar - 1947 / 59, very nice mint never hinged collection, complete with all issued stamps in the Lindner T hingeless printed form ring binder. Also the scarce initial printing set all from margin of sheet in perfect mint never hinged condition with photo certificate \"the quality is perfect\" Geigle BPP, the flood souvenir sheet pair, all welfare sets, Council of Europe, official stamps set, Day of the Postage Stamp and so on. A very nice quality object! 343 x Saar - extensive lot former and New Saar mounted on pages, in bags and so on. Including numerous mint never hinged issues. 597 / New Saar - 1947 / 59, rich collection on Lindner hingeless preprinted pages, in the number of a major listing except for the souvenir sheet pair complete including all welfare sets, Council of Europe, official stamps set and so on. Favorable! 687 ⊙ New Saar - 1947 / 59, extensive used collection, in the number of a major listing complete in the safe hingeless printed form ring binder with all good issues, stamp without guarantee, with also the flood souvenir sheet pair, all welfare sets, Council of Europe 1950, Day of the Postage Stamp, official stamps set without 100 Fr. And so on. A superb collection! Michel approximate 9500,- €. 696 ⊙ 9a Saar - interesting used lot different values Sarre-Germania including better colours and types, almost all expertized Burger BPP. With also Michel no. 9 a, 10 x, 17 AII / IV, 17 AV and so on. Favorable! 762 New Saar - 1947 / 59, clean mint never hinged collection, except for the flood souvenir sheet pair in the number of a major listing complete including all welfare sets, Council of Europe, postal stamps, Day of the Postage Stamp, official stamps set and so on. Favorable! 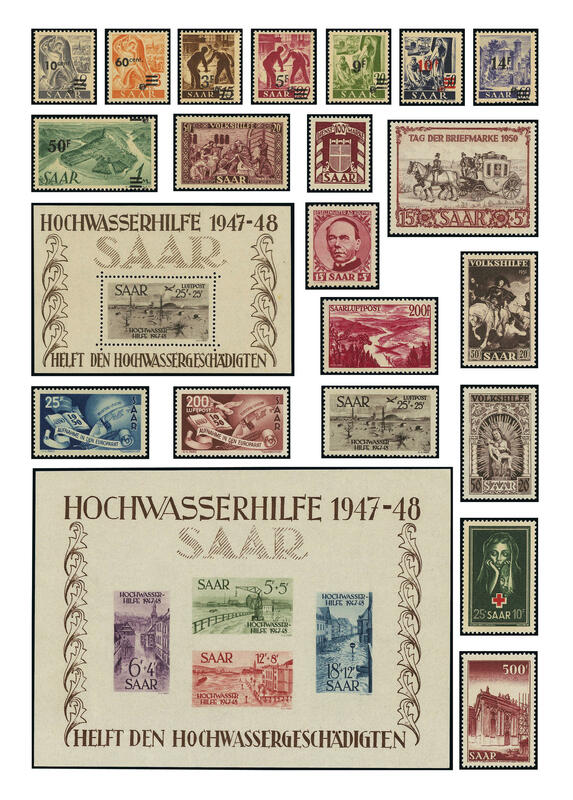 763 ⊙ New Saar - 1947 / 59, nice used collection, except for the flood souvenir sheet pair in the number of a major listing complete on Schaubek preprinted pages including all welfare sets, Council of Europe, Day of the Postage Stamp, without 100 Fr. Official stamp. Favorable valued! 859 ⊙ New Saar - 1947 / 59, nice used collection, except for the souvenir sheet pair in the number of a major listing more then complete including many expertized issues. Included are also flood set, youth hostel association twice, all welfare sets, Day of the Postage Stamp 1950 from corner margin with sheet number and perfect special cancel, Red Cross values, Council of Europe, official stamps set and so on. A magnificent object! Michel approximate 4600,- €. 905 New Saar - 1947 / 59, cultivated mint never hinged collection, complete with all issued stamps in the hingeless illustrated album. Also the scarce initial printing set in perfect mint never hinged condition with photo certificate \"the quality is perfect\" Geigle BPP, the flood souvenir sheet pair, all welfare sets, Council of Europe, Day of the Postage Stamp, official stamps set and so on. A very nice quality object! 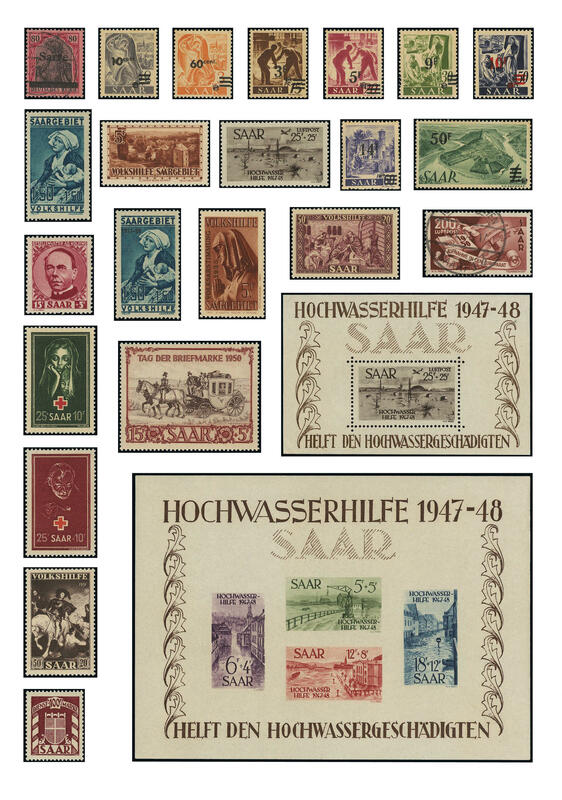 948 /⊙/ Saar - 1947 / 59, mostly mint never hinged collection on Borek pages with mounts with good postal stamps, special- and commemorative values, welfare sets, Day of the Postage Stamp, both Heuss sets and so on. 1012 ⊙ 206/25 New Saar - 1947 / 59, extensive used collection with numerous different issues on KABE hingeless preprinted pages. With also Michel no. 206 / 25, 226 / 38, 252 / 54, 255 / 59, 289, 293 / 95, Council of Europe 1950, 304, 319 / 37, the top values both Heuss sets and so on, stamp without guarantee, with a lot of genuine used material. Very favorable valued! 1031 /⊙/ Saar - rich collection former and New Saar in the spring back binder with plenty of better issues from Sarre-Germania, with also parts of sheets and so on. Please have a look! 1112 144/50 Saar - 1920 / 59, very nice and cultivated mint never hinged collection in the Borek hingeless printed form ring binder with numerous good issues. With also Sarre-Germania, 5 Pfg. 3 Mk. Bavaria Sarre expertized Burger BPP, all three landscape sets 1921 / 22, peoples help 1926 / 27, airmail stamps including Michel no. 158 / 59, peoples help 1929, 1. People help series 1931 (Michel no. 144 / 50), castle peoples help, Neunkirchen set 1933, both welfare sets 1934, referendum postage stamps set and airmail issue, as well the New Saar time in the number of a major listing complete including flood souvenir sheet pair, Council of Europe, the postal stamps, welfare sets, Day of the Postage Stamp and so on. A very nice and Cultivated object! 1136 New Saar - 1947 / 59, nice mint never hinged collection, nearly complete in the spring back binder with useful issues as for instance flood set, day of the horse 1949, official stamps set from the corner of the sheet (key value with sheet number), peoples help 1949 / 51, Day of the Postage Stamp 1950, Red Cross 1950 / 51 and so on. Favorable!